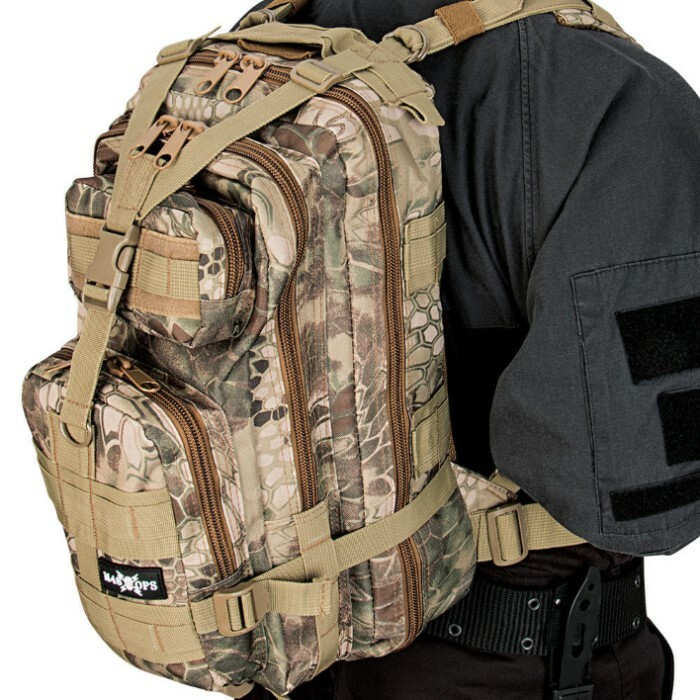 M48 Ops Gear Camo Daypack | BUDK.com - Knives & Swords At The Lowest Prices! Approx. 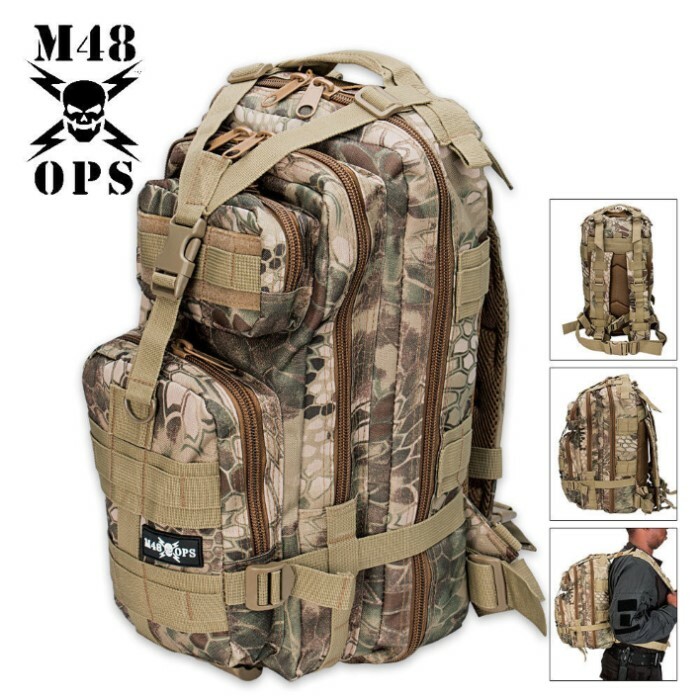 18" x 12" x 10"
This daypack from M48 Ops Gear covers all the bases with a multitude of pockets, compartments and zippers, allowing you to organize all your tactical day gear with ease and efficiency. Constructed of heavy-duty 600D nylon material, this daypack is rugged and built for daily, long-term use. Among its offerings are two large main compartments with mesh webbing and pockets to store all your small gear, including shotgun shell webbing and a pocket for your goggles or sunglasses. This daypack is also hydration compatible, allowing you to easily insert a bladder and eliminate having to carry a ton of bottles. The adjustable waist, shoulder and chest straps allow you to achieve a custom, comfortable fit, and the back panel features padding for added comfort. A drag handle is incorporated, along with ample MOLLE webbing for quick attachment of your other accessories. This is an awesome little backpack with a ton of great features including MOLLE compatibility. But I had to subtract one star due to the fact that this backpack is very small. I am 5'8 and weigh 168 pounds, and even after fully stretching the chest and waist straps as large as they can go it BARELY snaps closed. If you have a large body frame you will have great difficulty wearing this backpack comfortably and you might even have to just completely forego the chest strap because it is so tight and small. That being said, the backpack has a ton of pockets including a space for a camelbak bladder. 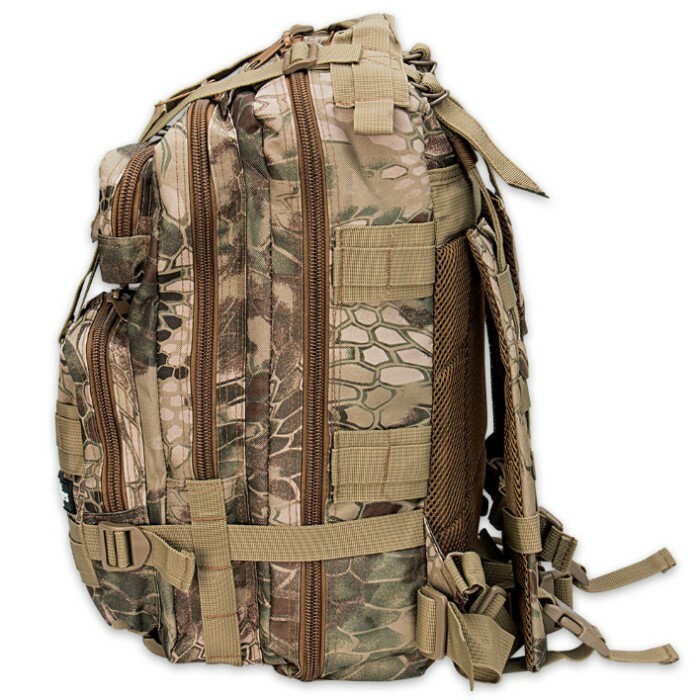 I have gone on numerous long hikes while wearing this backpack and it's nice having all the pockets for food and other survival gear. I also use it when I go shooting to keep my shooting glasses, ammo, ear plugs etc and it works great for that as well.